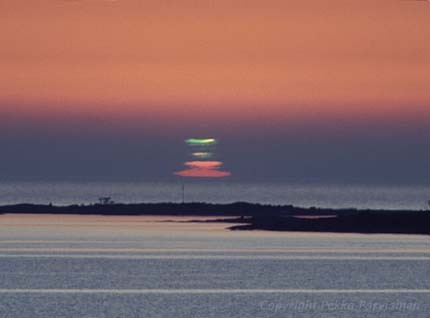 The image today is a classic image of a detached green flash, seen at sunset. You can see green flashes with the eye, sometimes, if you are looking toward a very clear horizon. You must be looking just at sunset, at the last moment before the sun disappears below the horizon and you have to be careful not to look too soon. Wait until just the thinnest rim of the sun appears above the horizon. If you look too soon, the light of the sunset will dazzle (or damage) your eyes, and you will miss that day’s green flash. There are many different types of green flash. Some describe a streak or ray of the color green … like a green flame shooting up from the sunrise or sunset horizon. The most common green flash, which many people describe, is a flash of the color green seen when the sun is nearly entirely below the horizon. You need a distant horizon to see any of these phenomena, and you need a distinct edge to the horizon. These green flashes, streaks, and rays are often seen over the ocean – but you can see them over land, too, if your horizon is far enough away. Pollution or haze on the horizon will hide this instantaneous flash of the color green. If you are interested in green flashes, Andrew Young’s green flash page is great. He also has a page of links to pictures of green flashes taken by people from around the globe. Here is another good article about the green flash by Peter Michaud. Here is a rather subtle green flash video. I had to watch it several times to convince myself I saw any green. Site contents copyright © 2019 Recorder Online	except as noted. All rights reserved. | 86 queries in 2.257 seconds.